…And now I think that all shower gels are drying. Compared to a gel, L’Occitane soap does leave a residue, but it is minimal and I stopped noticing it after a couple of uses. My breakouts are reduced and my skin is less dry. It washes makeup off better than any shower gel I’ve ever used, as even hard to clean places like the lash line are free of liner after a shower with the bar. I find it pleasantly surprising that such a skin-gentle soap is so hard on grime. The smell of Milk is that of shea butter and it stays in the shower and not on the skin (at least I do not notice it). L’Occitane Extra-Gentle Soap has converted me into a loyal consumer of their bar soap and has increased my respect and awareness of the brand. I do not get paid to write these reviews and there is no personal gain for me to be got for praising a product. This soap really is a perfect product to me. I do not want to try any other soap! 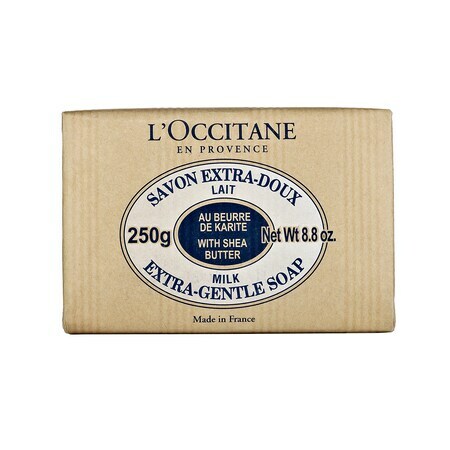 L’Occitane Shea Butter Soap: 100g for £3.59, 250g for £6.00 @ Escentual.com.